An eight-person team from Georgia Tech took the graduate team prize in NASA's college competition to design a DC-3 equivalent for 2058. Team members were Bryan Boiling, Alexis Brugere, Steve Gatto, Kevin Johnson, Kemp Kernstine, Mathieu Lanusse, undergraduate student Andrew Masse, and Keith Turner. ANASA competition asking college students to design a next-generation equivalentof the famed Douglas DC-3 transport aircraft has generated a stronginternational response and a standard of entries high enough to impress seniorNASA scientists. Altogether,61 students from 14 colleges and universities around the globe submitted designconcepts for the nextgeneration of small airliners and cargo planes. Entries came from 14 teamsand two individual students. "Theinvention, imagination and engineering exhibited in these college proposals wasextraordinary, and in parts superior to the concepts prevalent in the currentprofessional literature. These entries bode well for the future of civilianaeronautics," said Dennis Bushnell, chief scientist at NASA's Langley Research Center in Hampton, Va.
Bushnellwas one of several NASA experts who judged the competition. The judges gradedthe designs on criteria including creativity and imagination, feasibility andcost analysis, and comprehensive discussion of the design concept. Thecontest asked students to design a subsonic transport aircraft for the mid-21st-centurythat could carry from 25,000 pounds to 50,000 pounds of payload and operatefrom runways between 1,500 and 3,000 feet long. Effectively such an aircraftwould offer many of the same capabilities as the venerable DC-3, which now hasbeen in service for more than 70 years. However,NASA's competition required that, unlike the slow DC-3, students' designs forthe small transport of tomorrow should cruise at speeds between 595 mph and 625mph — about the average speed of jet airliners today. All designs were to becapable of carrying either passengers or cargo. 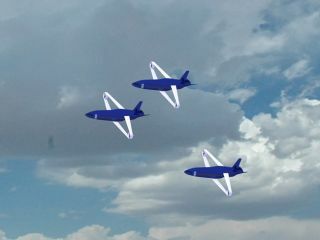 Thecompetition, sponsored by NASA's Fundamental Aeronautics Program, part of theagency's Aeronautics Research Mission Directorate, also stressed that conceptplanes should use alternativefuels and be quieter and more environmentally friendly than today'scommercial fleet. Aneight-person team from Georgia Tech in Atlanta took first place amonggraduate-team entries, with an imaginative biplane concept that used bothforward- and rear-swept staggered wings, each of which was linked to ductedfans at the wingtips. Undergraduate-teamhonors went to the STINGRAE concept submitted by a six-person team from VirginiaTech in Blacksburg, Va. The QUEIA concept submitted by a four-person team fromthe University of Miami won second place, and the PUMAshort-takeoff-and-landing transport jet design submitted by an eight-personteam from Ohio State University took third place. A two-student team from the University of Central Florida gained an honorable mention with its X-TS Advanced MultiroleAircraft entry. Solostudent Gary Redman from the University of Technology in Sydney, Australia, took first place among international entrants with his Oionos 43 33 concept. "Thenation's air transportation system is under tremendous pressure to increaseperformance and capacity withoutcausing additional damage to the environment," said Juan Alonso,director of the Fundamental Aeronautics Program. "Through competitionssuch as this, we are nurturing a new generation of engineers who can deliverthe solutions we so desperately need." Aspart of the competition, six U.S. students received a 10-week paid summerinternship at one of four NASA research centers around the country. Non-U.S.student winners received an engraved trophy and certificate. Thecompetition was part of an annual series run by NASA's Aeronautics ResearchMission Directorate. The directorate will announce the topic for next year'scompetition by the end of this summer.